Amongst the 'green' spaces within the village over and above those providing for sport and general recreation, there are others serving specific purposes but which are still wildlife friendly. This includes the churchyard and ruined church area and the allotments beside it. Glenfield Parish Council owns these allotments, with the main entrance off Main Street and a pedestrian access from Glebe Close. Allotments have become very popular over recent years and all of our allotments are taken. There is a modest rental for the allotments which come in three sizes. Rental includes the cost of the maintenance of the area, driveway, shelter, notice board and hedges and the cost of the water supply. The Parish Council has obtained an additional set of allotments off Mill Lane. 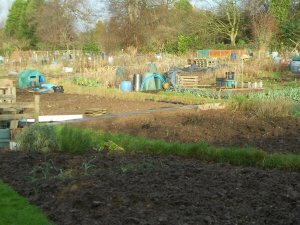 This site will accommodate about 20 full sized allotments but some have been sub-divided. Pricing of these units will mirror the existing plots. This land has been pasture land in the flood plain and as such should be very fertile and productive.